So I thought I was going to garden for the first time last summer. I bought a bunch of plants — random things that I’d never really had any desire to grow before — and I got some dirt (when you live in the sandy land like we do, this a thing you have to do), and I put them in it. I watered like crazy. And would you believe that not much happened? My peppers didn’t really grow any peppers. My melons only grew to be a few inches in diameter before the frost set in. I didn’t get any rhubarb from my rhubarb plant. I only got a couple of zucchini and a handful of peas from my plants. What I did get? A whole whack of tomatoes. Black cherry tomatoes and Roma tomatoes and tomatoes and tomatoes and tomatoes. My kids were totally cool with this, as they love tomatoes. I was a little bummed that the rest of my garden didn’t work out as planned, but hey, at least I got something! So this year, I’ve tried to be a little smarter about where and how to plant everything, and I’ve got my fingers crossed. The one thing I’m counting on? Some beautiful, juicy tomatoes. 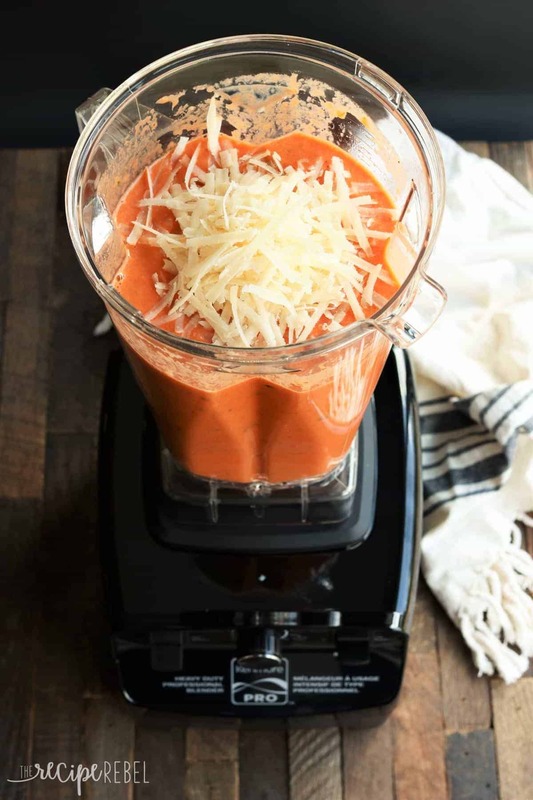 I’ve had the chance to try out this KenmorePro blender from Sears Canada this week and I know I should probably be making smoothies and milkshakes and ice cream and slushies buuuuuut…. all I could think of was roasted tomato soup. I’ve been itching to develop an easy homemade tomato soup recipe that I can use (and maybe even save and freeze for the dead of winter!) once my tomatoes get going, and I love the flavor they get from roasted in the oven, especially with garlic and onions. With a little — or a lot of — Parmesan cheese?!? So, so good. It is seriously one of the easiest summer meals you could make — just throw some tomatoes on a pan and roast them up, then purée in your blender, add some evaporated milk or cream (totally optional! 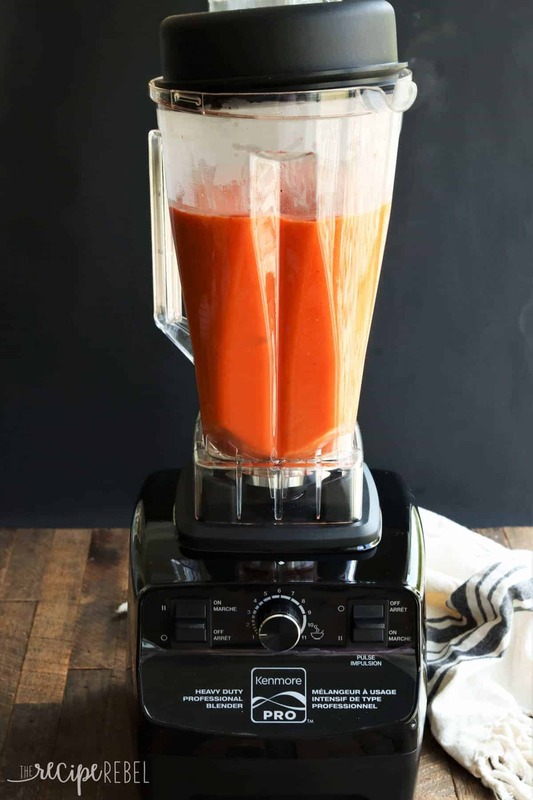 ), herbs, tomato paste and season to taste — so silky smooth, and if it gets a little cool you can heat it right back up in the blender itself. Pure magic! Don’t worry, though — those smoothies and milkshakes definitely happened 😉 But this was the recipe I wanted to share with you, because it’s not something to miss out on. Grab the ripest tomatoes you can find — they are going to have the best flavour! Use whichever herbs you have handy that you love with tomatoes! Almost anything goes here. This soup is naturally gluten-free and vegetarian. You can easily skip out on the milk and cheese to make this a dairy-free, vegan recipe. 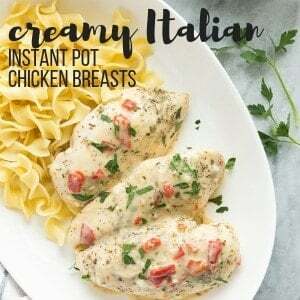 *This post is generously sponsored by Sears Canada and I was compensated for my time in developing this recipe. Thank you for supporting the brands that make this possible! 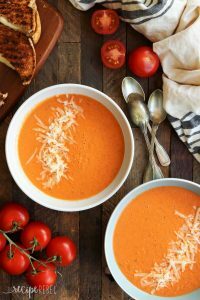 This Easy Roasted Tomato Soup is MUCH better than the can and couldn't be simpler -- perfect for fresh garden tomatoes and herbs! A healthy gluten-free and vegetarian meal with dairy free and vegan options. 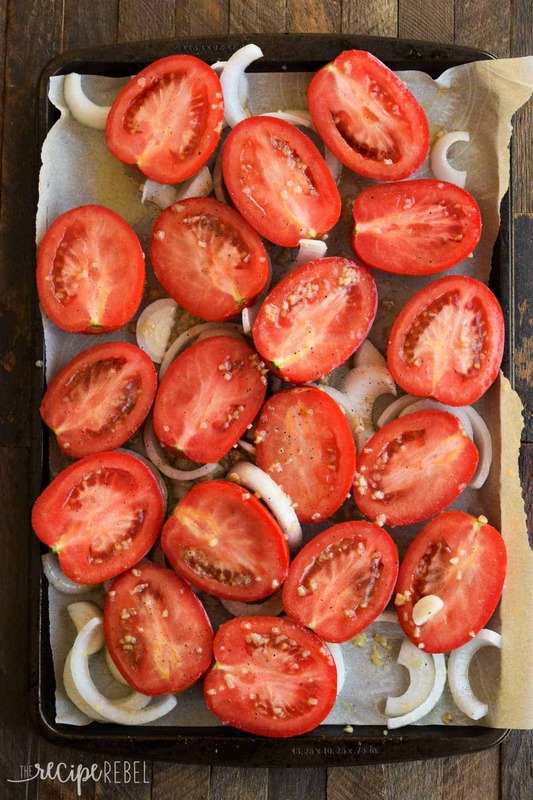 Halve tomatoes and place cut side up with the onion on a rimmed baking sheet. Drizzle with oil and add garlic, salt and pepper. Stir to coat well. Roast for 40-50 minutes, just until starting to brown. Place in the blender and puree until smooth (you'll want to leave the lid cracked slightly so the steam can escape). Add milk, cheese, basil, tomato paste, and sugar and puree until smooth. Taste and adjust seasoning to your preference. Serve immediately with grilled cheese for dunking (obviously!). This recipe also has 58% of your Vitamin A, 110% of your Vitamin C, and 35% of your Calcium needs. Okay, so i don’t always comment…..but i just HAVE to. This is one of the best soups i have ever made….if not THE best. Oh my goodness…..Cannot believe how yummy this soup is! 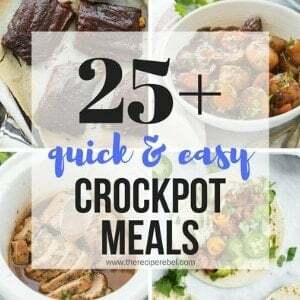 We have “soup night” with our neighbors and with the recent cold snap here in Texas, i wanted to try this recipe before serving it to our neighbors next week. My husband kept going on and on about how good it was. I can’t wait to share this with our “Soup Night” neighbors on Wednesday! Made this exactly as written. Only problem i have is making enough! Going to try and double the recipe this week. Thank you again for this wonderful recipe. It’s already hand written in my book where the very most special recipes go! BTW, i served this soup with this sandwich….. – and it’s the best grilled cheese i have ever made too! Parm in the butter that goes on the grill side of the bread makes it SO crunchy. 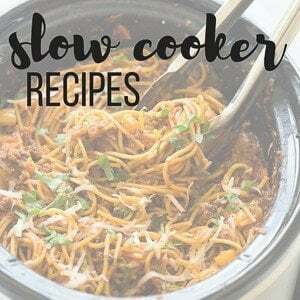 Just a yummy dinner last night and had to compliment you on this recipe! I am so happy to hear that Cindy! I am definitely going to try adding parm to my butter for grilled cheese from now on! Would I be able to use veg stock instead of the evaporated milk/cream please? I can’t say for sure because the pH level has to be just right, and I haven’t tested the pH level. I think that some people have, or have frozen it for later, but I can’t say for sure! This is an amazing recipe! It’s 9pm and still 80 degrees and humid outside but I have the oven running at 400 to roast the second batch of tomatoes! Going to make more soup since the first batch got gobbled up as soon as it was done!! Thank u for helping me to use up my abundance of garden beauties! This recipe is a keeper! I am so glad you’re enjoying it! Thanks for coming back and leaving a comment! Absolutely delicious I can’t stop eating it ?? OMGoodness!!!! Made this a few nights ago – sooooooo good!!! Making more this morning! We have sunsweet cherry tomatoes in our garden – you know, the orangish/yellow ones. I roasted a couple cups of those right along with our other garden tomatoes for this soup. Just SOOO GOOD!!!!! Hope it tastes as good after being frozen? I want to take some to our reunion trip in 2 weeks. THANK YOU!!! I haven’t tried it frozen but I’d love to hear how it is! I’m so glad you liked it! I made a large batch, put some in freezer bags to enjoy this winter!! Such a great idea! Thanks Robin! I read that you leave the seeds in. What about the skins? You leave them on as well? You are the opposite of us. Our tomatoes always wait until we go on holiday and then they choose to ripen, much to our neighbours’ joy, as we tell them to help themselves. Roasting is a great way to use them and it’s especially tasty in a simple tomato soup. Love this recipe. You are so lucky! This year we haven’t gotten very many 🙁 I will have to find some neighbors to borrow from! Roasting the tomatoes first is absolutely brilliant! I could eat bowl after bowl! Hi, Ashley, tomato soup is my favorite. Your recipe looks good. I always add veggies and make. Here I want to know about adding tomato paste. What difference??? Are the seeds left out or ground fine? I don’t take the seeds out at all. This soup was amazing! Added a splash of vegetable stock, I loved the roasting of the veggies! Great soup, will make again! Hi Kim! I’m so happy to hear that they both worked out well for you! Canned tomatoes are an awesome substitute for the winter months! For the cans tomatoes would u after u cook the tomatoes in the pan then would u put in the blender after? The tomato paste? I add it straight to the blender. Was looking for a recipe to use up some of the tomatoes from my garden. Such a good recipe (not least because one didn’t have to peel the tomatoes which is a time-consuming bore)… plus it freezes extremely well and somehow gets an even deeper flavour?? Any suggestions for freezing? I want to make some with my tomatoes from the garden but it’s too hot here in Minnesota for soup but would be great in the winter! Freezing is still something I haven’t tried — I should but we don’t usually have enough leftovers! There are others who have frozen and I believe it turned out just fine, but you could scroll through the comments. When you say it makes 4-5 servings, can you tell me about how many ounces that is? I’m trying to gauge if I need 1 or 2 recipes for a party. Hi Susan! I’m sorry, I actually don’t know how many ounces. Each serving is probably about 1 1/2 cups, but that is a rough estimate. It’ll depend a lot on the size of your tomatoes. FABULOUS recipe! My apartment smelled SO good while the tomatoes were roasting. I wasn’t a fan of tomato soup for about 30 years until recently. I’ve been trying a more “whole foods” approach to my meals, and so happy to find this recipe. I would love to try this as a pasta sauce, as well, by chopping instead of pureeing the roasted tomatoes. I am so, so glad you enjoyed it! I think it would be great as a soup as well! Such a good recipe (not least because one didn’t have to peel the tomatoes which is a time-consuming bore)… plus it freezes extremely well and somehow gets an even deeper flavour. You didn’t reply back to July 25 question. I haven’t made this soup yet but It sounds delicious & will be making it soon. I would also like to know if you can freeze it. You’re right — I must have missed it! I think it would freeze fine but I have never tried it, so I can’t really say for sure. I’d love to hear how it works out if you try it! Have you frozen this? I have an over abundance at the moment and would love to freeze for colder times? This is my favorite soup. We are trying to make veggie meals a greater part of our meal plan. This will help. Pure comfort food. I like my grilled cheese sandwich done extra crispy and cut up into croutons and added to my soup. Going to give your recipe a try. And this blender sounds amazing and a great price too. Will enter over on IG. 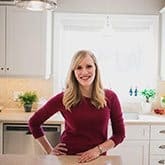 Thanks for all the great recipes you share. I used whole milk instead of evaporated milk and it was plenty thick and creamy. It was a delicious soup and will make again. This soup sounds like the best way to use up the abundance of tomatoes we always have at the end of the growing season! Us too! It’s the one thing we always seem to have lots of! Tomato soup is my favourite and this one sounds delicious!! This soup sounds delicious and a perfect use of my garden tomatoes this summer! My tomatoes are slowly but surely coming and I can hardly WAIT to use up a bunch of them to make this gorgeous tomato soup! Love that you roasted the tomatoes and I’ll bet that gives it the best flavor! I slacked a little on planting a garden this year, but that’s definitely my goal for next summer…and you can’t beat tomatoes! They’re my favorite veggie from the garden and it sounds like a perfect use for this soup! 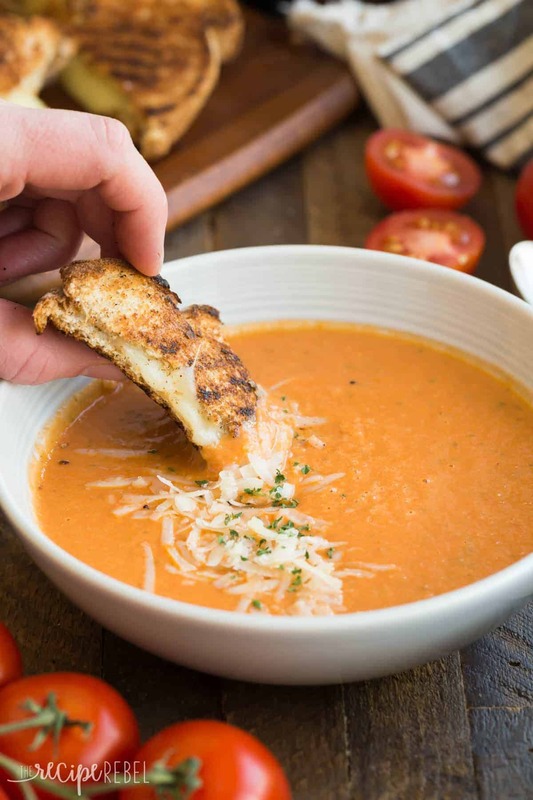 I can never get enough of homemade tomato soup, especially when it’s so easy to make. This looks like such a good comfort meal, Ashley! Thanks Gayle! Tomato soup is one of our favorites here too!